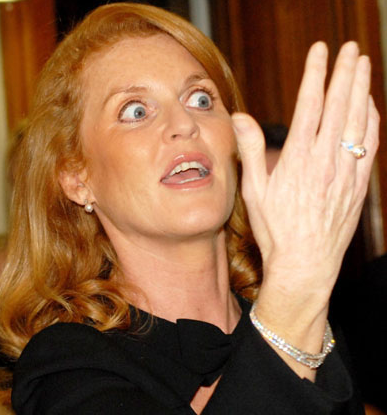 fleet street fox: Earth calling Fergie. IT is wrong that a mother is banned from spending Christmas with her children, that she is not allowed to work and provide for herself in case it embarrasses her former in-laws and that the world mocks a woman who doesn't have a supermodel's arse. I want to feel sympathy for Sarah Ferguson, I really do. But every time she opens her mouth I want to smack her in it. "Daddy sold my pony," wails a FIFTY-ONE-YEAR-OLD WOMAN. "Mummy was mean, nobody loves me, I didn't get to go to Wills' and Kate's wedding, boo hoo hoo." Well, I didn't have a pony either, not that I gave much of a toss. But had I later in life married into one of the wealthiest horse-owning families in the world I'd have been up to my neck in nags, wouldn't I? "I'm still a duchess," insists the bankrupt, penniless, woman who lives with her ex-husband FIFTEEN YEARS after they got divorced and expects to travel everywhere by Bentley and private plane. Can anyone tell me which she has less of to rub together: brain cells or pennies? A few weeks ago Fergie was bemoaning how "difficult" it was not to be invited to the wedding, even though no divorced-mum-of-the-groom's-cousins would normally get invited to a nuptials. "I felt so totally worthless," she whined. "The last bride up that aisle was me." She spent the whole day on the phone to her ex-husband, who had to talk about how wonderful their own wedding was to calm her down, and then she went on Oprah - where else? - to lament: "I really love the feeling that sort of Diana and I both weren't there." Yes, it's great the groom's mother was tragically killed while he was still a child. Everything with Fergie is 'me'. Me, me, me, me, poor bloody me. Princess Di's dead but it's about ME. Someone else gets married and it's ME. I entirely understand she's had a tough draw from the deck in a couple of respects, but on the other hand she's had a pretty good deal. And she's fifty-one. A mother-of-two. She's had a lot of experiences from which she really ought to have learned: instead she's as needy as a four-year-old whimpering for attention. GROW UP. It can't be long til we get the "I'm dyslexic, you know" interview and she starts sucking her thumb in public. The only good thing that seems to have happened to Fergie recently is that after her wedding snub she went on holiday to Thailand - presumably paid for by someone else. "The jungle embraced me," she beamed. 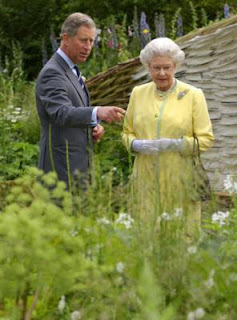 Charles: "And this is the plant we're training to eat Fergie..."
Queen: "What a wonderful idea."